Do you desire a new look in a hurry? If so, consider revamping the color of your hair. Nothing positively affects your appearance faster than a new hair color. With our versatile coloring services, we can conceal grey hair, add subtle highlights to dull hair or help you make a bold statement with a vibrant shade. Whatever look you desire, we can help you achieve it with fresh color. 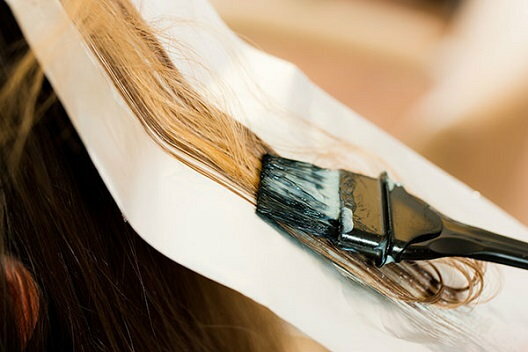 Our simplest, fastest coloring choice is the single process treatment. This works great if you are going darker with your hair color or covering grey. Expect ease and shine. Would you like to achieve a new hair color that’s more than two shades lighter than your original color? If so, you will likely need a double process treatment. The first step is lightening the hair so it can accept the new pigment. The second step is adding your new color. We use the traditional foil method for this extremely versatile method of coloring. Would you like to look like you just came back from a beach vacation? We can add subtle blond highlights to make that happen. Or, go wilder, with contrasting colors in thin stripes or wider chunks. Getting full-head highlights means that we will space the highlights all the way around your head. Partial highlights are usually done around the face. Lowlights are just like highlights, but refer to making parts of your hair darker instead of lighter. For example, a strawberry blond who wants to add streaks of auburn might choose lowlights. This look adds dimension and can appear quite natural. We have all heard that blondes have more fun. Make an appointment for blonding if you want to test this hypothesis. Nothing makes you look older than your actual age than having grey hair. If you aspire to achieve a more youthful look, we can cover that grey with color. This fun technique has gained popularity with celebrities and girls next door over the last few years. 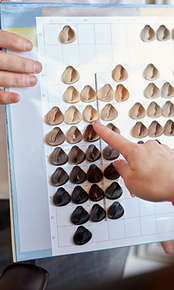 It means the hair is shaded or graduated from a darker shade on top down to lighter ends. Sometimes, ombre is done very dramatically, from brunette to platinum. Sombre is ombre’s subtler cousin. With sombre, you achieve a softer look, with just a few shades of gradation. With balayage, stylists paint your color on in freehand, rather than using foils, giving your hair a natural, sun-kissed look. Balayage is popular with celebrities and looks more natural than most other coloring techniques when growing out. This fun and creative technique is much like ombre, but involves at least three colors gradually melting together. Color melts do not necessarily go from dark on top to light on bottom. We can retouch roots that are growing out, during a quick visit to our salon. We can tint eyebrows, so darker ones are lightened and match a new, blonder look. We can also tint eyebrows to match the purple tones in a color melt, for more daring clients. Your eyebrows frame your face, so make sure they are the color you desire. Ready for Your New Look? Our stylists are highly trained in both traditional and modern coloring methods. We regularly attend continuing education classes to stay on the cutting edge of hair-coloring trends and techniques. Most importantly, however, we love doing color! Schedule an appointment with us, and, together, we’ll dream up a gorgeous new look for you.